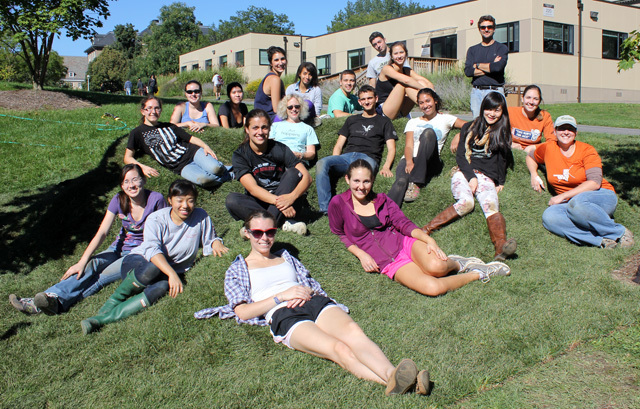 Art of Horticulture students lounge on the sod sofa they built. On Tuesday, students in the Art of Horticulture (HORT 2010) enjoyed a beautiful afternoon of collaboration, camaraderie, and creativity, as they brainstormed together to plan and then build a piece of sod furniture. 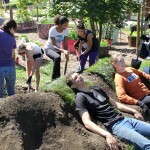 They shaped and firmed five cubic yards of soil, installed the sod, and frolicked on their creation. 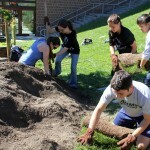 The resulting sofa, located near the permaculture garden and adjacent to the Trillium, will offer students a chance to enjoy our beautiful campus from a unique vantage point. The smaller group of students in the studio class (which is taken for an additional credit) drew inspiration from models created the previous day by the entire class. The ultimate design evokes a spirit of intimacy, with a larger seating area, along with smaller ‘pods,’ a love seat, and chaise area. I was pleased to see how the design appeared so intimate, cohesive and integrated, despite combining a number of elements. It was exciting to witness the number of observations students had about how much they learned, as well as the their feelings of pride and affection for their work of art. 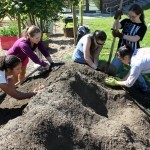 Students observed the initial daunting feeling of being faced with a large mound of soil. 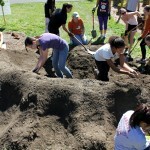 But they quickly arranged themselves into teams, and tackled different facets of the task seamlessly. 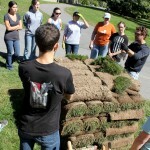 Frank Rossi, associate professor and turf specialist in the Department of Horticulture, provided additional coaching, and shared lively guidance that ranged from the science of working with turf, to how to lay sod. 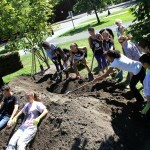 Kevin McGraw, Cornell Grounds, collaborated to have the materials on site, and supported the work in numerous ways. 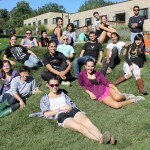 Our hope is that the Cornell community enjoys the chance to take a seat – literally. 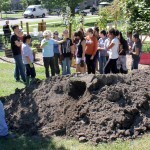 View images and video from previous installations.